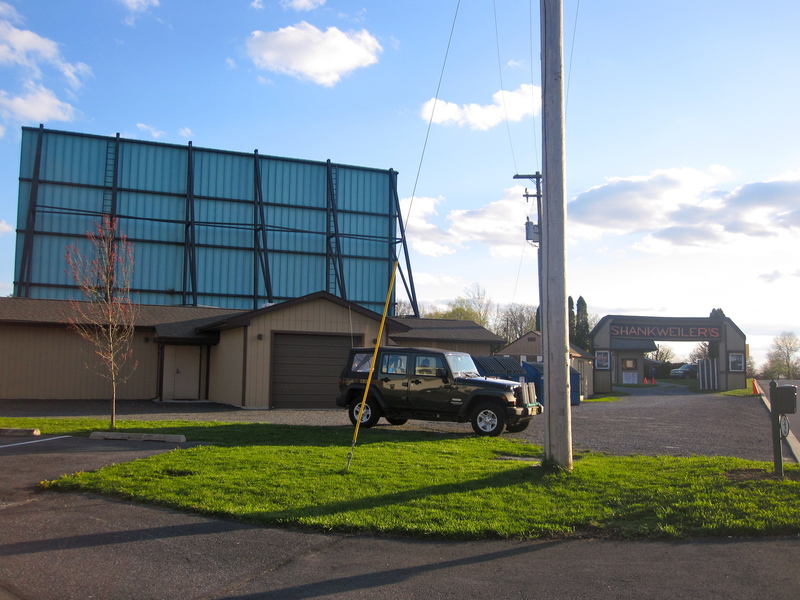 The Mahoning Drive-In Theatre opened in 1949 and continues operation today! Bethlehem Steel constructed the 105-foot Cinemascope screen in 1948. 1949: Opened. Operated by Max Korr, Mitchell Rappaport and Shirer. A.M. Ellis also took up 50% interest in to the Mahoning (Ellis Theaters of New Jersey). Ellis operated drive-ins in New Jersey.
? – 2013: Owned by Mike and Deb Danchak, who also own the nearby Angel Theatre in Coaldale. Over the years, the car capacity increased gradually to eventually reach the current capacity of approximately 900 cars. In 2013, Mike and Deb Danchak closed the theatre for the season on September 8. This was the time the movie industry announced they would be switching film from 35mm to digital – with no more than one year left for possible 35mm films available for current movies. A digital projector was a pricey investment. 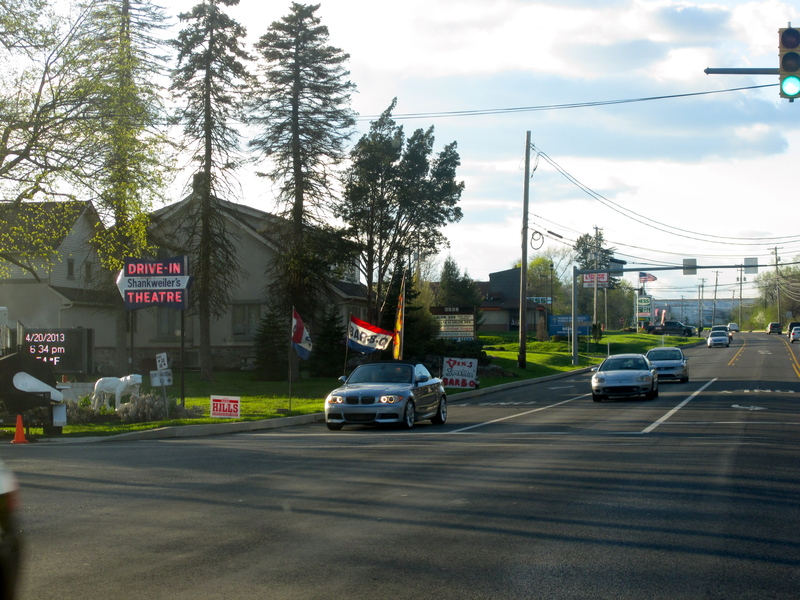 A bamboozler – Glen Brannon – took advantage of the drive-ins difficulties and reached out to Mike Danchak about saving the theater. 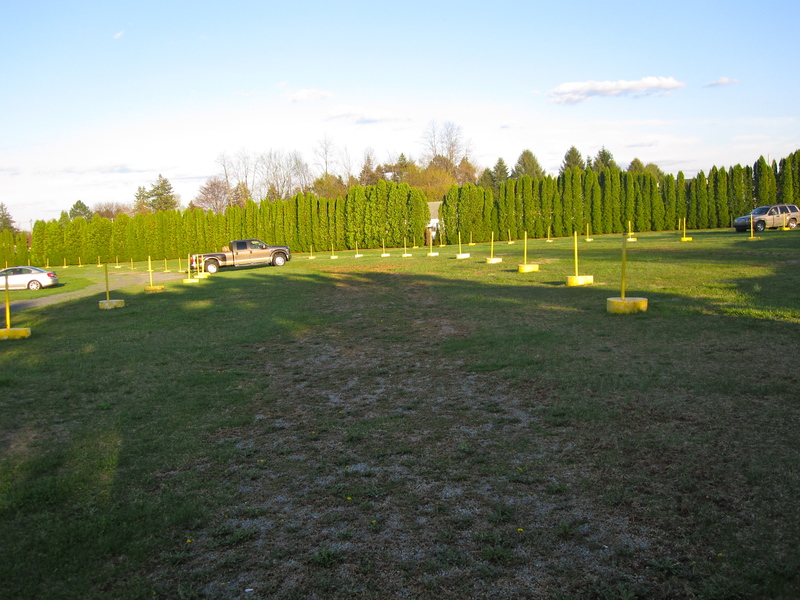 There was a major fundraising effort to fix-up the drive-in. Volunteers came to the drive-in and painted the projection booth, for example. There was an online fundraising page to raise money for the projector and other needed improvements. Depending on the amount you donated, you were able to receive a gift of some kind. I remember seeing the opportunity to buy carload passes for the upcoming season as well. Personally, I donated money in hopes to keep the theater alive and running! Brannon headed all of these processes, with the promise of updating and revitalizing the Mahoning DI. However, Brannon turned out to be a swindler. He had dealings with several other theaters and you will be hard pressed to find a positive piece of information about Brannon. See the given links at the end of this post for information about Brannon. 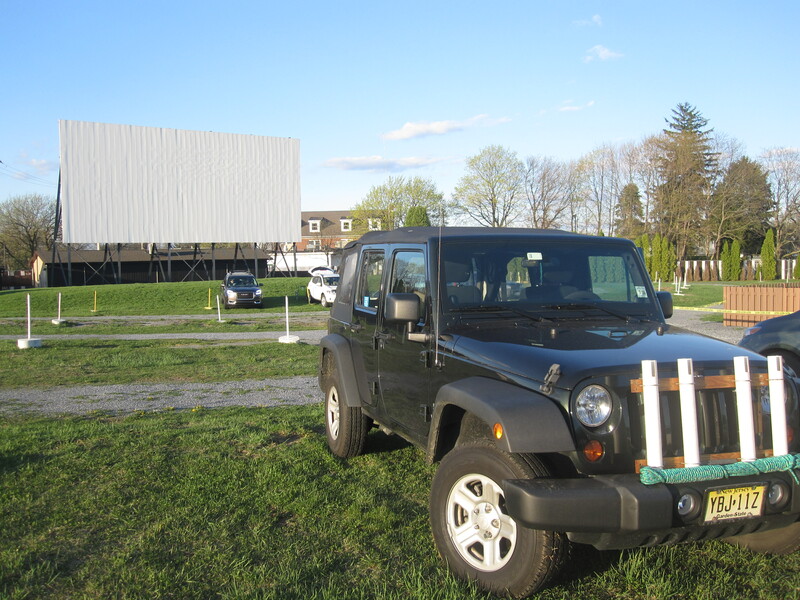 Jeff Mattox took over the drive-in in 2014 and for a brief stint, renamed the theater as “Big Pocono Outdoor Theater.” He managed the Mahoning from 2001-2007, and part of the 2010 season, prior to returning as the new owner. On July 22, 2014, Mattox officially added McClanahan and Cardamone (Mahoning FB page). For the 2014 season, the Mahoning continued to show first-run movies from the companies that would provide 35mm films. Per a Facebook post on March 17, 2014, Jeff initially believed the Mahoning would need to purchase a digital projector to continue into the 2015 season. 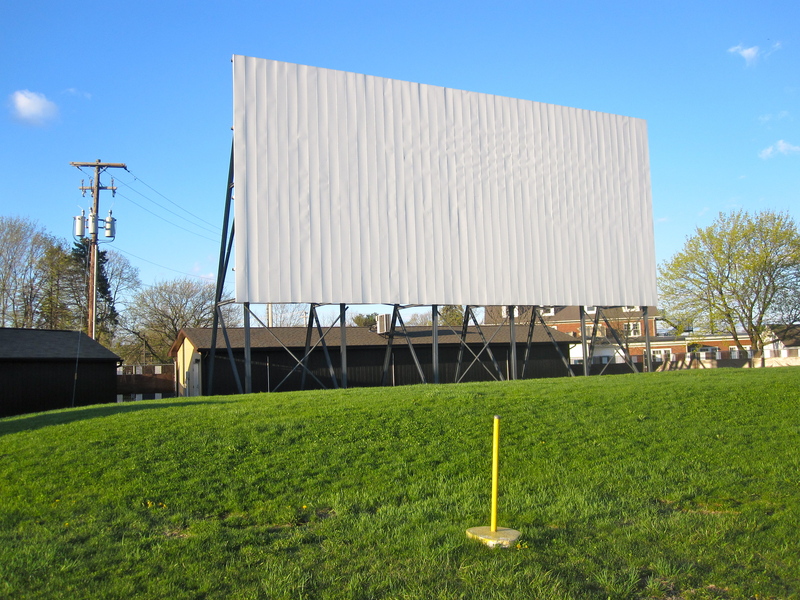 However, the Mahoning switched to nostalgic movies for the 2015 season and continues today. You also have the option to camp if you are interested. 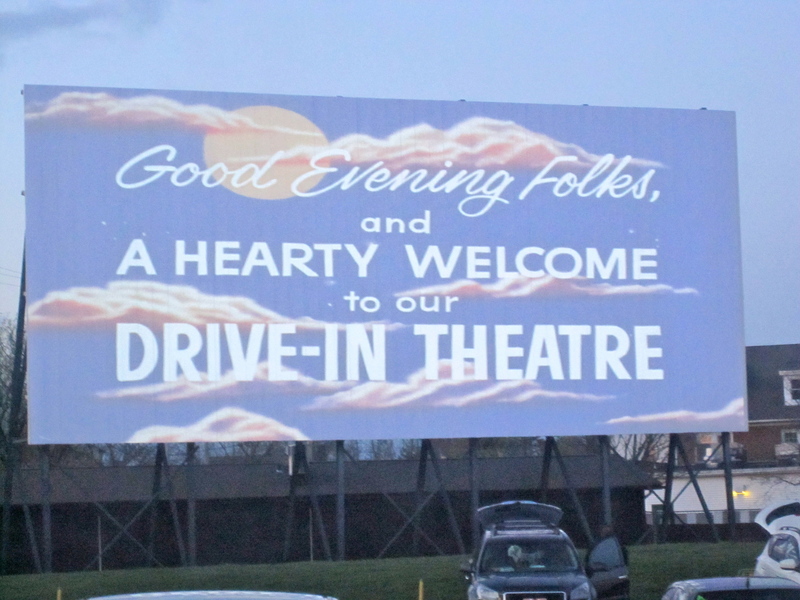 Our stop at the Mahoning Drive-In Theater was a double hit – we had a movie night at Laurel Drive-In Theater (35 minutes away), but also stopped by the Mahoning for a brief photo shoot! The Mahoning Drive-In had closed for the season the previous weekend, but we still wanted to see the property. I was instantly excited by the beautiful marquee – the red arrow directing patrons was eye-catching and gorgeous. 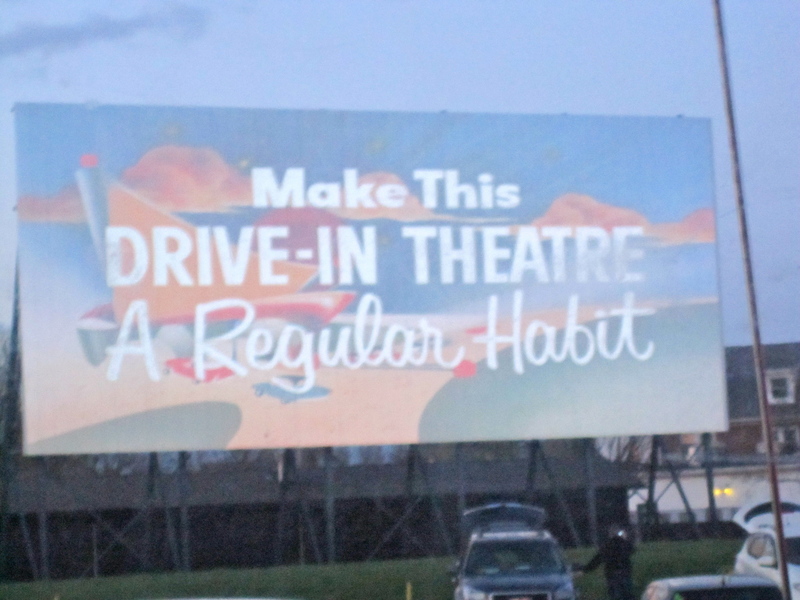 Who doesn’t love an old-fashioned drive-in marquee? 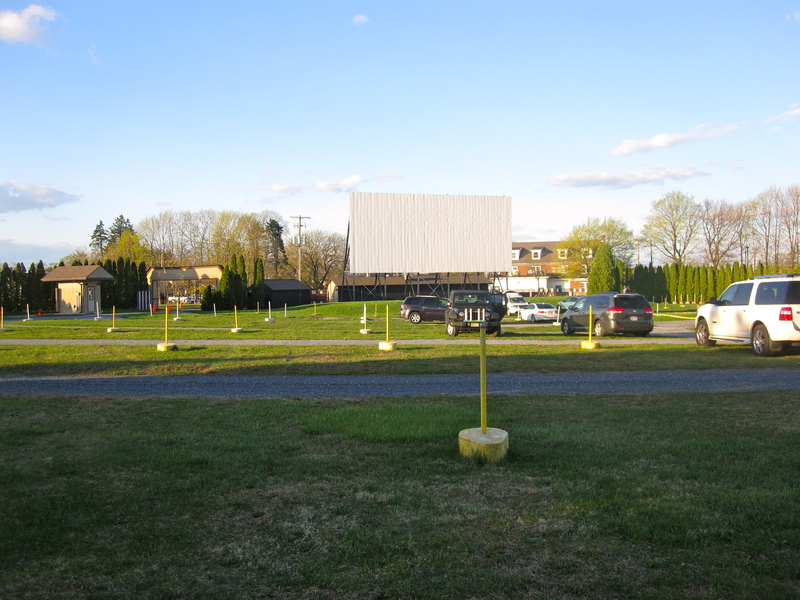 We approached the drive-in property – you can see the screen as you drive down Seneca Road. Mahoning DI has a fun entrance with ticket booth and overhand introducing the theatre. The left side was blocked with a chain, and based on the tracks on the ground, has not been used in quite some time. Regardless, you could easily picture two rows of cars lined up for a night of movies! Inside the theater, there is a paved roadway for the entrance and to the exit, as well as around the projection booth. The car parking/viewing area was covered in grass. The projection booth was standard concrete, white with colored polka dots. There were openings for the projector to project the movies onto the large CinemaScope screen. The screen is always one of my favorite aspects to photograph. Along the top of the screen, there was either speakers or lights. Under and slightly behind the screen was a small building. I’m unsure the purpose, but photographed it anyway. Finally, the EXIT sign guided us off the property for the day. Random side note, we took our photos of the marquee on our way out. There were a few piles of trash around the property – not too unusual for older theaters. For Christmas, I unwrapped my very own pair of drive-in speakers and stand! My husband came through with an amazing gift, and linked me to a fun Facebook page as well. 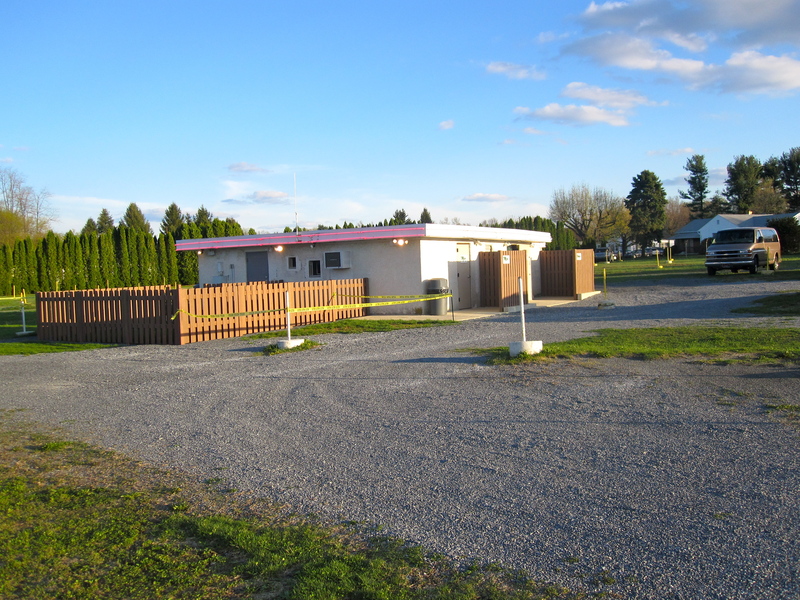 While browsing the recent posts, I came across some photos of the Moonlite Drive-In Theatre in West Wyoming, Pennsylvania – BEING RENOVATED! 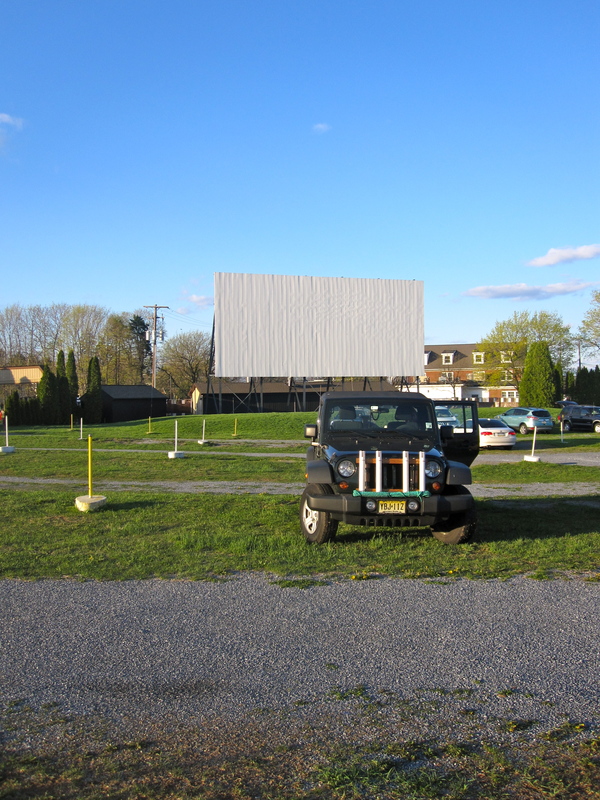 The Borough Council accepted the purchase of the drive-in by Eric Symeon and approved a variance for the land to become a drive-in again earlier this year. I hope some of the memorabilia Mr. Symeon found in the buildings will be put on display – I almost wish I had withstood the heat and bugs to browse the property more when we were there! Best of luck and well wishes during the renovations – the marquee already looks 110% better and only good things can happen from here on out! 3 Cheers for another drive-in theatre brought back to life (Coming: Spring 2018!). **Make sure to check out my original post about the Moonlite Drive-In! 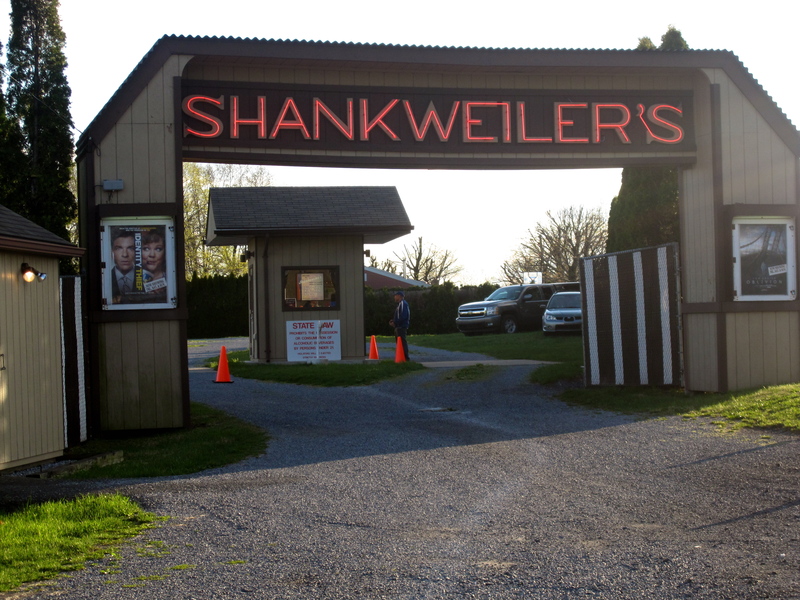 I was pumped when we decided we would take the hour and a half drive up to Orefield, PA to attend the movies at Shankweiler’s Drive-In. 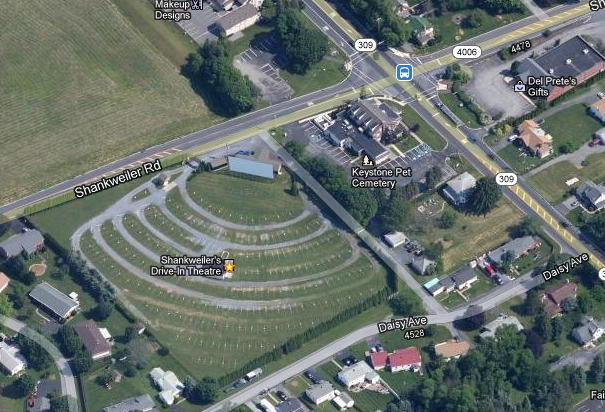 My adventures to visit other (open) drive-ins outside of Delsea DI were really happening!! 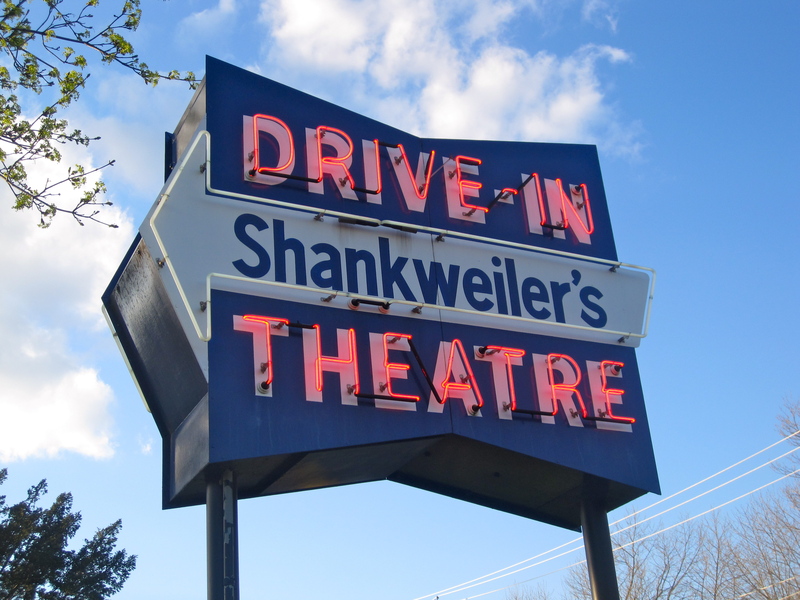 Shankweiler‘s is the longest-running theater in America – it opened on April 15, 1934 and has been in continuous operation since. Impressive (and quite awesome) to say the least. 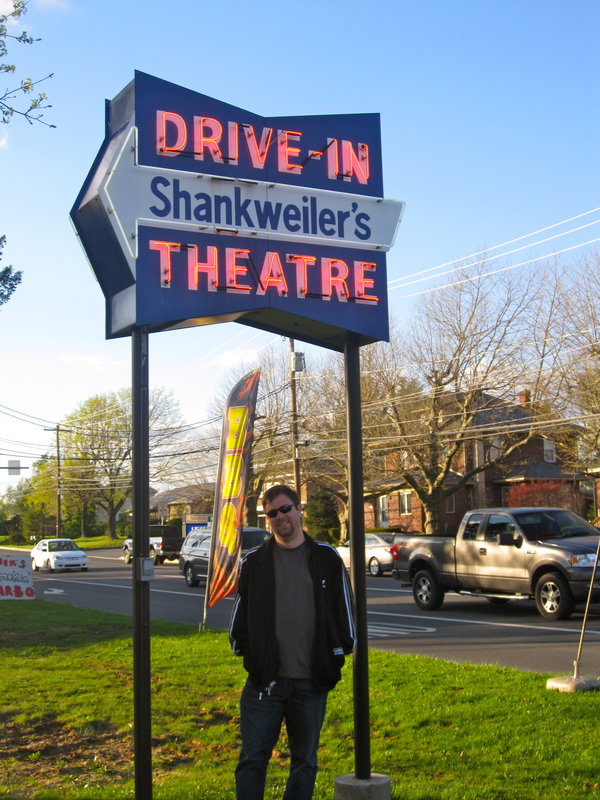 Shankweiler’s was actually the 2nd drive-in to open in the United States, following the original Camden Drive-In in NJ (…that will be a blog in the near future). Unlike the Camden DI, however, Shankweiler’s has managed to survive! When they first opened, Shankweiler’s used sound projected from a speaker near the screen. As inventions and technology advanced, Shankweiler’s added speaker poles and car speakers in 1948. As far as sound goes, the use of an AM station occurred in 1982, and then finally the advancement to FM frequency in 1986 (the year I was born!). FM radio is the current sound projection used by Shankweiler’s, as it seems to be with the majority of DI theaters I have researched. I found it interesting to learn about Shankweiler’s screen… originally it was a simple sheet, stretched out. Then it was a “shadow box” or small screen. However, in 1955 a rough hurricane (I shall not speak her name!) destroyed the screen and projection booth. That same year, a new screen was built, as well as a projection booth/concession stand/restroom location. The screen and building for projections/concessions/bathrooms in 2013 is the same from 1955. In case you didn’t figure it out, Shankweiler’s has one screen. According to drive-ins.com and a few other sites, about 300 cars is the capacity. Showtime was 8:15 pm, and we arrived at 6:39 pm (according to my camera). As we came to the stoplight at Rt 309 and Shankweiler Rd, the Neon Sign across the street had me fumbling with my camera for a good shot. I was bouncing in the passenger seat, anticipating the view of the entrance. As we made the left-hand turn, the back of the screen and entrance marquee was prominently in view. I mean, you can’t miss the place! We pulled over and parked right outside to get some photos – crossed the street to the neon sign, and then back over so we could enter the theater. When we pulled in, only about 3 cars were parked already. Since we are a “high vehicle” we had to park between the yellow poles. After 3 tries, we found our perfect spot. Blankets and pillows were arranged, and then I started snapping pictures. I liked that there was gravel for driving and grass for parking, delineating the spots and allowing a bit more comfort if you chose to sit outside the car. I did see one girl jumping rope before the movies, and a couple of families setting up chairs. 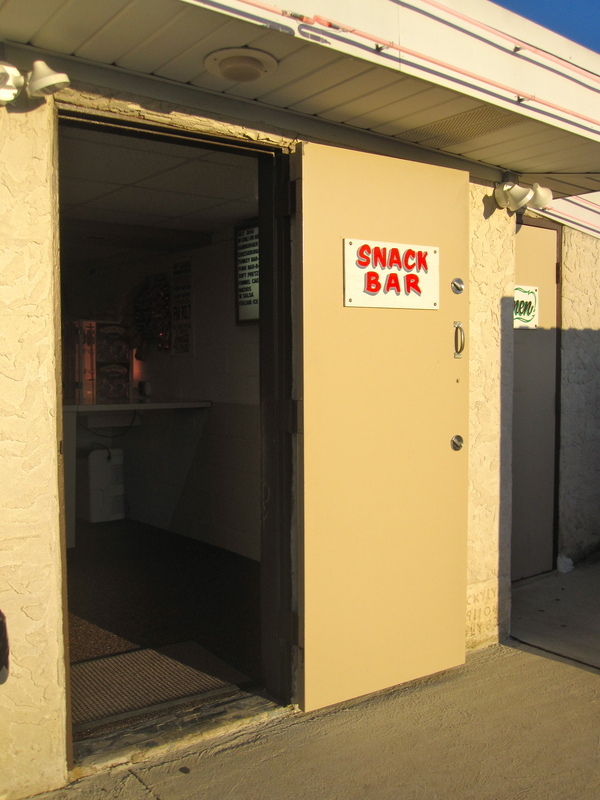 The concession stand had the basics – hot dogs, burgers, popcorn, goobers, and other candy assortments. An entrance on both sides of the building allows customers to get their food easily, regardless of their parking destination. My hot dog was perfect, the large soda was GIANT, and the popcorn was yummy. I have to say it was VERY COLD that night. Even under sleeping bags and 2 blankets I felt the chill. Definitely not a night to sit outside, and also might be the reason for a smaller attendance rate. It was also the first weekend they were open so word might not have gotten out yet. Let’s face it, not everyone is receiving weekly newsletters or checking websites a few times a week! Regardless, it was a great night. I had a chance to speak with Susan, one of the owners, before the first movie. What a sweet person! According to their 70 Years pamphlet, Susan and her husband have been part of the Shankweiler establishment since 1971 and then purchased the theater in 1984. Susan shared that they have several, non-local families that visit each year. 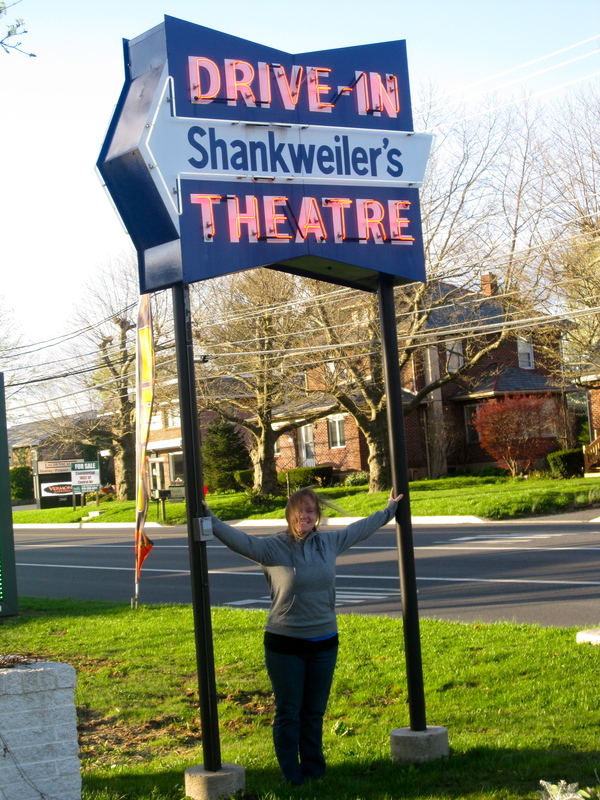 Shankweiler’s is truly a great place to visit, enjoy a couple movies, and create your own drive-in memories. Check it out! Aerial View – So neat to see it like this! When on Rt. 309, about to turn left onto Shankweiler Road – there is the sign!